Over the years, Monitor Audio has earned the reputation of being one of Britain’s most prestigious and widely respected makers of loudspeakers. To some, that statement might sound somewhat insignificant, but I think it remarkable -- the UK has one of the most fiercely competitive speaker markets in the world. 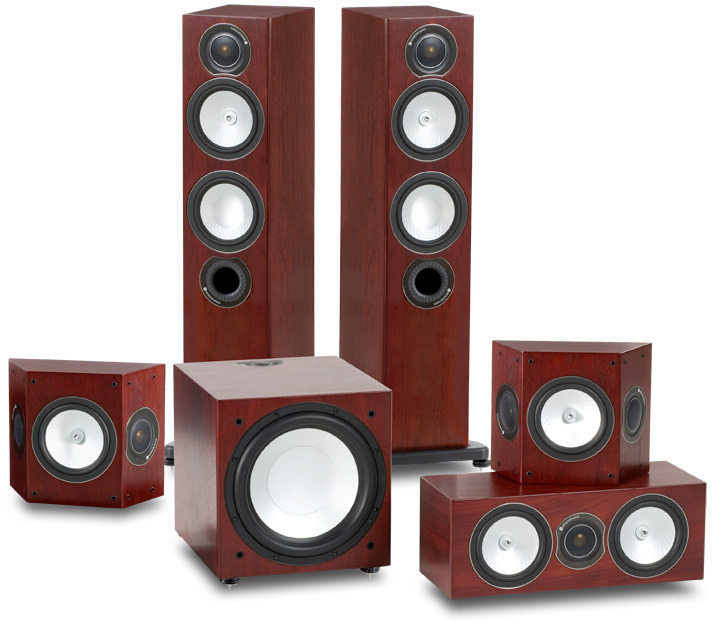 With competitors such as B&W, ProAc, Mission, and Acoustic Energy all vying for big shares of the market, a manufacturer can’t afford to make speakers that are merely on a par with the competition. In such a market, any company that wants to be competitive needs to aim well above the bar, and put forward products that not only offer the virtues of performance, quality, value, and innovation, but do so in a way that will ensure they are not only noticed but remembered. The founders of Monitor Audio recognized this in 1972, when the company began, and later when they designed a speaker that was the antithesis of the conventional. The R852MD carved out its own niche by being the first loudspeaker to include an alloy driver. Its dome tweeter, made of a combination of aluminum and magnesium rather than a single metal, made this speaker not only sound good enough for people to take notice, but impressive enough to be remembered. So began the long relationship of metal drivers and Monitor Audio. Over the years, Monitor has advanced this technology, and now uses several metals and alloys throughout their various speaker lines. The subjects of this review comprise a member system ($3975 USD) of the all-new Silver RX line. Monitor Audio’s Silver RX speakers aren’t simple revisions of the RS line but evolutions. For instance, the Silver RX6 ($1250/pair) is a 2.5-way bass-reflex tower with two 6” Ceramic-Coated Aluminum Magnesium (C-CAM) drivers and a gold C-CAM dome tweeter, much like the older RS6. But quite a bit has changed. 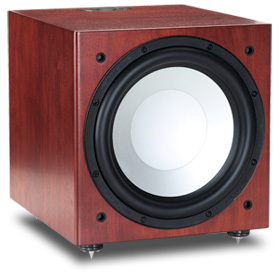 First, Monitor has completely redesigned the cabinets of every speaker in the series. 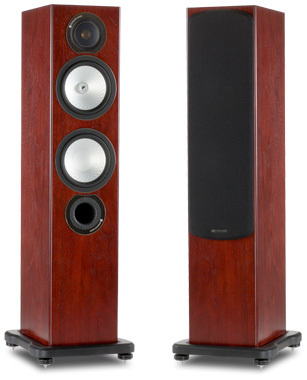 The RX6 towers in particular have grown in every dimension when compared to the RS6, now measuring 35 5/8”H x 10 13/16”W x 12 3/16”D, yet weighing a still manageable 36 pounds. The most notable growth, though, is the thickness of the MDF walls, which has been increased to 19mm throughout the entire cabinet. This was done to reduce cabinet resonances and increase cabinet rigidity; it also marked the first of four major improvements made during the redesign of the line, all of which are based on technology trickled down from the GS series. Next up was the addition of radial and cross-bracing techniques, which again offer increases in cabinet rigidity, and therefore lower cabinet colorations even further. Knocking with my knuckle any of the top and side panels sounds a lot more inert. The third improvement was the addition of independent chambers to house the midrange and bass drivers of the Silver RX6 and RX8 towers. This way, each chamber can be individually tuned to provide better bass control and imaging. Finally, and arguably the most ingenious, was the use of bolt-through driver technology throughout the Silver RX line. This ties driver and cabinet together with a bolt that extends from the rear of the drive-unit through the back of the cabinet. The driver is then tensioned into the cabinet by tightening a small nut on the rear, which essentially compresses all four sides of the cabinet while securing the driver in place. Trickled down from Monitor’s flagship Platinum series, this is said to further increase the speaker’s overall bracing and increase its rigidity. The 6” C-CAM midrange and bass drivers have been redesigned to incorporate the latest version of Monitor’s Rigid Surface Technology (RST). Essentially, this is the use of dimples in the surface of the cones of the C-CAM drivers, which Monitor claims significantly increases the cone’s rigidity. This in turn makes it possible to use thinner, lighter cones. In addition, RST is said to minimize the generation of standing waves in the cone’s surface. The drive-units’ rigidity has been increased through the use of baskets cast of a new, nonmagnetic polymer. Used throughout the Silver line is a new 1” C-CAM gold-dome tweeter, whose damped rear chamber helps to improve clarity and offers a slightly wider frequency range of 2-35kHz. This means that this tweeter can be crossed over to the midrange cone lower than before, for a more seamless transition. With a moderate impedance and above average efficiency, these speakers should be easy to drive with any decent-quality A/V receiver. Changes made to the new Silver RX Centre center-channel speaker ($675 each) and Silver RXFX surround ($750/pair) were essentially the same as in the Silver RX6, differing only in cabinet design and crossover frequencies. These speakers have sealed enclosures and, because of their smaller size, somewhat less thick cabinet walls, though they’re still thicker than the outgoing RS models. The squat RX Centre -- it measures 19 11/16”W x 7 5/16”H x 7 7/8”D -- was redesigned to ensure that it would perform better in a closed cabinet or close to a wall. This was made possible in large part by the increased rigidity afforded by the bolt-through driver technology, but also by the thicker walls. 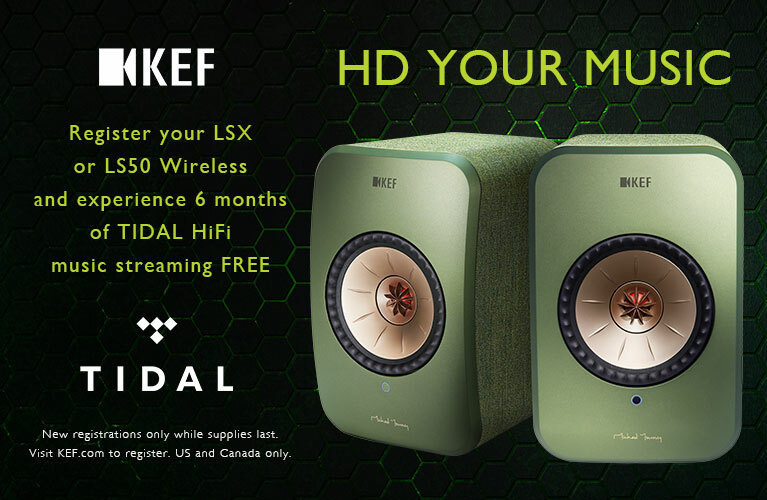 The RX Centre’s bass extends to only 45Hz; its crossover frequencies are 500Hz and 3kHz. The compact RXFX surround (11 13/16H x 4 3/4W x 9 13/16D) has clearly been well thought out. It has hardware for hanging it flush to a wall, recessed terminals, and selectable dipole or bipole operation. Its smallish sealed cabinet houses a single 6” C-CAM RST driver flanked by two 1” C-CAM gold-dome tweeters -- no mystery why its bottom-end output is limited to 60Hz. But not to worry -- these surround speakers integrated so well with the rest of the system that they all but disappeared. Laying the foundation for this system is the Silver RXW-12 subwoofer ($1300), which has undergone a few significant changes of its own. Having grown slightly in size, to 13 3/8”H x 13 3/8”W x 16 1/8”D, the new cabinet’s walls are still made of 1”-thick MDF all around, as are the internal radial and cross-bracing, but the RXW-12 has a completely new 12” C-CAM driver with a two-magnet motor system and a massive 3” voice-coil. Powering this is a class-D amplifier rated at 500W RMS, with a Switched Mode Power Supply Unit (SMPSU) claimed to deliver a peak output of over 1000W. This new amplifier affords the RXW-12 enough grunt to reliably reproduce frequencies as low as 21Hz. The RXW-12 also has a two-position EQ, to address boundary interaction. There’s also a 12V trigger, so that the RXW-12 can be powered up or down via a signal from one of your associated components. Visually, all of the speakers in the new Silver RX line exude class and quality; their impeccable fit and finish, in my opinion, are unparalleled among their peers. The bolt-through technology pays dividends not only technologically but visually, eliminating any trace of mechanical driver attachments on the front of the cabinet. To complement this new look, Monitor has replaced (in all but the RXFX surround and RXW-12 sub) the older plug-in grilles with ones that magnetically attach. In addition, the RX6 tower comes supported by a heavy, cast-metal plinth that screws securely into the bottom of the cabinet. Also provided are well-thought-out, adjustable feet that end in rubber (for hardwood floors) or spikes (for carpets). The choice of high-quality veneers has changed; cherry and silver have been dropped in favor of sexier high-gloss black or white, for an additional $200/pair. The standard finishes are all real-wood veneers: Black Oak, Walnut, Natural Oak, and Rosenut. I used an Oppo BDP-83 universal Blu-ray player as the source, connected via HDMI only to my Integra DHC-80.1 A/V processor, which fed signals to a Rotel RMB-1075 power amplifier. All interconnects were Analysis Plus Copper Oval In Micro; speaker cables were River Cable Flexygy 8s. All electronics except for the Monitor subwoofer were plugged into a Rotel RCL-1040 power conditioner; I plugged the RXW-12 directly into a dedicated wall outlet. My listening room measures 25’L x 13’W. I placed the Silver RX6s 8’ apart, 8’ from my listening position, and about 1’ from the front wall. The Silver RX Centre was directly between the two RX6s, sitting atop my TV cabinet, and the Silver RXFX surrounds were placed on 36”-tall stands slightly behind my couch and about 9’ apart. I used the surrounds in dipole mode, as I mostly listened to high-resolution Blu-ray material. Before sending me the Silver RX system, the folks at Monitor Audio were kind enough to run them in for me so that I wouldn’t have to spend a few weeks doing that. However, after hooking them up and watching a few favorite Blu-rays, I was caught off guard; they sounded a bit lean, and lacked the kind of dynamic sound that speakers from Monitor’s Silver series have traditionally possessed. So, still not knowing precisely how long these speakers had spent being broken in, I installed them in my living room, for a few weeks of uncritical use with all kinds of media. In that time something of a transformation happened, and the Silver RX6s, especially, came into their own. I began my viewing and listening with Jon Amiel’s The Core. During the scene in chapter 14 when the sun starts to literally cook the Earth through a hole in the planet’s ozone layer, the microdetails of the sun’s rays cooking the water had real sizzle, giving me a distinct idea of just how hot that water was. Complicated material was handled with ease; the sound of sizzling paint remained even as the melting steel of a bridge groaned, cars thunderously exploded, and the bridge at last fell into the water. In chapter 20, when Rat downloads the secrets of Project Destiny and the final credits roll, a music track is played in full surround; through this system, the overall sound was immersive. It reminded me what it’s like to listen to music while watching a show in a planetarium where the sound seems to come from everywhere, though no speakers are visible. With Hitman, the Silver RXW-12 proved its worth by adding just the right amount of weight and speed during the scene of hand-to-hand combat in chapter 10, offering forceful impact with every blow. This scene begins in a train car, with a sword fight that ends up on the tracks themselves. I was thoroughly impressed with how the Silver RXFX surrounds re-created the sounds of multiple swords whooshing through the air at high speed convincingly enough to put me right in the midst of the battle. By this time I was starting to get a clear idea of just how much of an improvement the new tweeters brought to the soundstage. The clang of the swords hitting the rails was brilliantly animated, lasting just long enough as the rails ceased vibrating and the sounds decayed. Every component of the new RX system contributed to make this scene terrifically engrossing. Having been so captivated by the speed and impact offered through the Silver RXW-12 during Hitman, I moved on to another BD and cued up Roland Emmerich’s The Day After Tomorrow. The improvements wrought by DTS-HD over standard DTS were clearly demonstrated through the Silver RXes, especially in chapter 12, when a helicopter’s rotors freeze in mid-air and the aircraft crashes to the ground. The Silver RX system did a remarkable job of delineating the individual crackling sounds of the ice forming on the blades. The fun continued in chapter 14, when water flooding the city was represented by a deep, continuous rumble emanating from seemingly everywhere. However, I did come to realize that, while forceful and convincing, the Silver RXW-12 is more a finesse subwoofer rather than a mere furniture mover. That’s not to say that it won’t dig deep -- it did -- but you’ll have to play with the volume and EQ settings to find what suits your tastes and your room to get it to sound its best. Rifling through my movie collection once again, I came across Heat. With a grin on my face and the words oooh ya coming out of my mouth, I selected chapter 31 and watched the famous bank-robbery scene. It could have been the shift to a standard Dolby Digital soundtrack, but with Heat I found the overall sound through the Monitor Audios somewhat richer. This didn’t diminish individual sounds; bullets shattering windows were still cleanly delineated, and gunshots were still presented with excellent scale and impact. What did change was the atmosphere in which the scene was presented. Some of the microdetails were now harder to hear or simply absent, but what was added was a sense of depth and realism. Somehow, these speakers managed to create a more convincing atmosphere from seemingly less detail. Being one who believes that a well-built, competently designed speaker will perform equally well with music and with movies, I briefly listened to some two-channel material before focusing on multichannel recordings. I cued up “Hotel California,” from the Eagles’ Hell Freezes Over (CD, Geffen GED 24725), and was immediately struck by how well the leading edges of voices and guitars were illustrated through the Silver RX6s. Kick drums had real kick -- I could feel as well as hear the tempo -- and cymbals were precise and immediate while sounding nowhere near too sharp. When I listened to this track through a pair of Paradigm Special Edition SE 3 speakers ($699 each), it couldn’t have sounded more different. Although the Paradigms articulated percussion instruments equally well, their sound was livelier, brighter, and crisper overall. Cymbals were fast and vivid, pick slides on guitars were more emphasized, and bass, though not as smooth, felt punchier. But the Paradigms’ slightly more forward nature charmed me for only so long -- as soon as the volume went up, so did all that well-lit detail, which now became a little too bright. By contrast, turning up the volume with the Monitors proved what I later found to be one of the RX6’s most endearing qualities: its ability to play loudly without losing control or becoming the least bit aggressive. Having the Monitors in my system was like replacing my Integra pre-pro with a tube preamp. With Heat, the Silver RXs’ richer sound was even more apparent. The Paradigm SE 3s presented background details, such as spent bullet casings hitting the ground, more clearly; voices had greater texture; and the bank-robbery scene had a bit more intensity because it seemed louder overall. But the Paradigms lacked the natural atmosphere I’d heard with Monitors, so in the end this may simply be a matter of preference. I preferred the Silver RXs’ more natural sound. When I watched BDs with hi-rez soundtracks, the differences were far less obvious, especially with The Day After Tomorrow. The helicopter scene was very realistic through the Monitors; the Paradigms seemed to slightly overemphasize the details of the water freezing, as if implying that the rotors, after freezing, would shatter. During Hitman, I experienced much of the same: the swords hitting the railroad tracks sounded fuller and more tonally neutral through the Monitor Audios. The Paradigm SE system, on the other hand, had a more analytical way of presenting these details. The last Blu-ray I listened to through these speaker systems was Doomsday. The Monitor Audio and Paradigm systems both did excellent jobs, but it wasn’t till I’d watched the narrative presented by Malcolm McDowell in chapter 2 that I discerned what kept drawing me to the Monitor Audio system: I was captivated by the holistic picture this system produced within the soundstage. Listening to McDowell through the Monitors, I tended to focus on his voice, and not on what was going on behind it. I believe this is what director Neil Marshall intended -- as if to convey the feeling of numbness you get when you’re in shock and able to focus on only one thing at a time. Listening to this chapter through the Paradigms, all of the components of this passage are clear and obvious -- the granularity of McDowell’s voice, the faint voices in the background, the crackling of the fires, the many military sounds. Through the Monitors I could still hear all of these things, but the slightly richer sound of McDowell’s voice at dead center of the soundstage, with the rest of the sounds being presented in a more subtle manner, managed to create a very in person experience. Time and again over the past few months I’ve been thoroughly impressed by Monitor Audio’s Silver RX system, and will be sad to see them leave. My experiences of music, and especially of movies, through these speakers have left me with a strong impression: This system has the uncanny ability to make possible an emotional connection to the sounds it reproduces. If you’re in the market for a new home-theater speaker system, or even a pair of stereo speakers that offer a genuine taste of the high end in a classy, high-quality package, you owe it to yourself to give the Silver RX system a serious audition. Highly recommended! Warranty: Five years parts and labor (two years on subwoofer amp).